Greig Spence’s 86th minute winner was enough to see Raith Rovers through to the semi-finals of the Ramsdens Cup for the first time since 2003, after a deserved 1-0 win over Falkirk at Stark’s Park. Raith made two changes from last weeks 1-1 draw at Cappielow. Dougie Hill missed out after his red card appeal was dismissed on Thursday and was replaced by Laurie Ellis, whilst up front 17-year-old Lewis Vaughan came in for Gordon Smith who dropped to the bench. 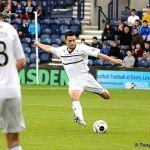 Falkirk started the brighter and, whilst they struggled to create any clear-cut early chances, the pace of their front men, and Philip Roberts in particular, suggested that the game was going to be a stern test for the Raith back line. The first scare arrived on 5 minutes. A harmless looking cross into the Raith area was palmed into the air by David McGurn but he gathered on the second attempt with the former Arsenal man Roberts waiting to pounce. Despite being on top, Falkirk almost gifted an opener to Raith after Craig Sibbald gave away possession on the edge of the box to Calum Elliot. However, the ball was just too far ahead of him, giving Bairns keeper, Graham Bowman, the chance to clear the danger. Raith’s first shot came after 10 minutes and it arrived after some clever work by Lewis Vaughan won Raith a corner. 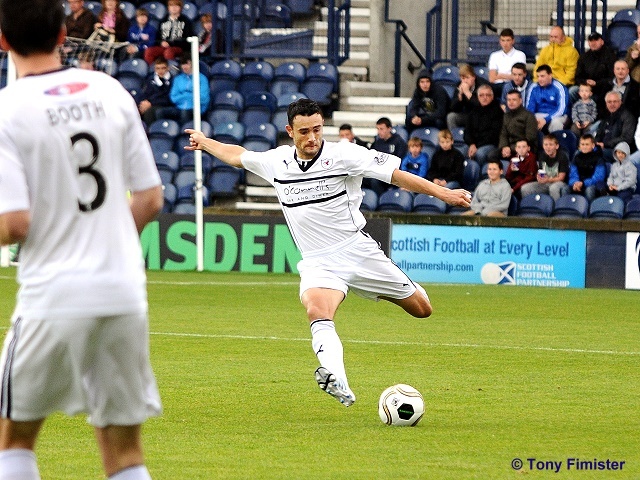 From Cardle’s delivery, the ball was cleared only as far Kevin Moon who sent his half-volley crashing over the bar. Five minutes later, Falkirk should have gone ahead and the fact they didn’t was down to the profligacy of Rory Loy. Some good work down the right hand side from Roberts saw him reach the bye-line and cut it back to the former Carlisle striker. But from six yards out he somehow managed to steer his shot wide. Loy then tried to make amends moments later but his shot was charged down by Paul Watson. Rovers had started to make some headway in the match but decent chances were few and far between. Cardle made room for himself inside the box but his dinked cross was just too high for Anderson. Elliot then tried his luck from 20 yards but his shot was never testing Bowman. Falkirk’s impressive opening to the match had started to fade and while Philip Roberts had indicated early on that he was the man to watch, the Raith defence dealt with him capably from the opening quarter of an hour onward. Rakish Bingham, the new loan signing from Wigan, was also struggling to impose himself on the game with the new central defensive partnership of Laurie Ellis and Paul Watson dealing with him comfortably. Lewis Vaughan was showing his ability only in flashes but he brought out Bowman’s first stop of the match on 33 minutes, after he scampered along the edge of the box and sent in a shot that the keeper punched wide for a corner. Although Rovers maintained the upper-hand for the remainder of the half, they did so without really looking like scoring and the 0-0 scoreline was a fair reflection of the opening 45 minutes. The second-half started in a comical manner with Raith immediately playing the ball out of play. It wasn’t just the home side who were making mistakes as the early stages provided a memorable free-kick routine from Falkirk. Twenty-five yards from goal, the ball was rolled to the side but everyone in a Falkirk jersey remained completely motionless, allowing the Raith defensive wall to simply stride forward, gather up possession and lead a counter attack, much to Grant Holt’s disgust. The Bairns should have gone in front a minute later. Craig Sibbald was the provider, floating a cross into the box for Phil Roberts. With no Raith defender in sight, the front man guided his header wide of the target, much to the irritation of the Falkirk fans behind the goal. Raith should have made the visitors pay for that miss after 55 minutes but after good work by Cardle and Anderson, Fox blazed his shot over the bar. Raith were now the side in the ascendency but frustratingly their crosses from both wings were never quite good enough, either going too long or too close to the goalkeeper. Falkirk were creating very little and other than some good work by 17-year-old Conor McGrandles in midfield, no-one in dark blue was proving to be a threat. Grant Murray made his first change with just under half an hour remaining, swapping Lewis Vaughan for Greig Spence, and the striker was involved straight away, winning possession in the middle of the park and laying it off to Grant Anderson. However, the winger’s attempt to pick out the same player in the box was slightly over-hit and the chance was lost. Spence’s introduction lifted the crowd but, more importantly, it lifted the team who suddenly seemed to have a bit more belief that they could make the breakthrough. They almost did so when good work down the left by Booth enabled him to pick out Elliot on the edge of the box but his shot on the turn was blocked. The same player then shot over the bar after some head tennis in the Falkirk penalty area and, with just ten minutes remaining, a Fox effort from 25 yards fizzed just over. With the minutes ticking down, extra-time was looking far likelier than a winner but just as the fans started to prepare themselves for another 30 minute period, Raith got the goal their dominance deserved in the 86th minute. Booth and Spence got themselves in a tangle on the edge of the six-yard box with both of them unable to turn on the ball and get their shot away. The ball was only cleared as far as Jason Thomson, who advanced to the bye-line and sent in a low cross to Greig Spence who expertly guided the ball past Bowman from close range. Other than a late Falkirk free-kick that was again wasted, Raith comfortably held on to take their place in the semi-final draw alongside Annan Athletic, Stenhousemuir and the winners of the tie between Queen of the South and Rangers. Watson yellow. Falkirk free in a good position. last chance cleared and its ful time!!!! RAITH: McGurn Thomson Watson Ellis Booth Anderson Fox Moon Cardle Vaughan Elliot. Subs: Roberts Spence Callachan Donaldson Smith. 6 Paul Watson gets stuck in. 8 It's the Persil challenge. 9 Calum Elliot in the tick of it. 11 This is a whistle Mr Fulton. 14 Liam tries a shot on goal. 18 Greig Spence puts Raith into the semis.